Rooms from $87.20 per night. Located in Columbus this hotel features an outdoor heated pool and rooms with free Wi-Fi. It is located one mile from Interstate 185 and Columbus Park Crossing shopping center.Guest rooms at the Holiday Inn Express Columbus at Northlake include premium cable TV. Each is equipped with a microwave and a refrigerator.The hotel offers a gym with a stationary bicycle and 2 treadmills. Guests can relax in the jacuzzi or work in the business center.Columbus State University: Coca-Cola Space Science Center is a 15 minute drive away. Northlake Holiday Inn Express Columbus is 12 miles from the Chattahoochee Riverwalk. 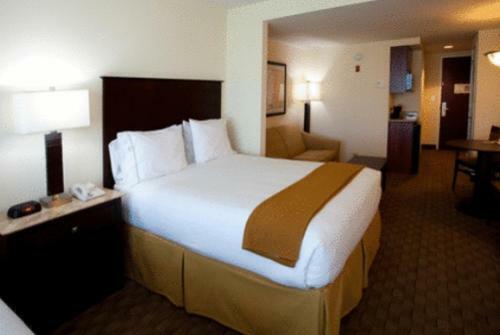 Add Holiday Inn Express & Suites Columbus At Northlake to your free online travel itinerary.